Thomas Watson - meherbabatravels jimdo page! Among the persons gathered to receive Meher Baba his was an elderly man ( 78 )named Thomas Augustus Watson, who had come with his wife - Elizabeth, from America to stay at the retreat for two days. 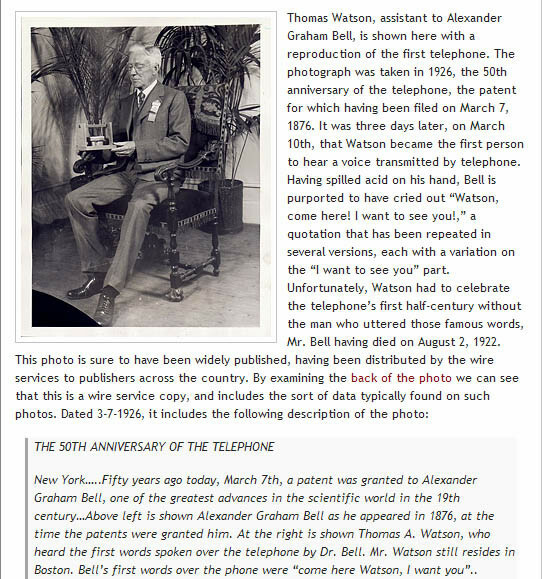 Mr. Watson was the scientist who had worked with Alexander Graham Bell in inventing the telephone, and since retired was searching for spiritual knowledge. Upon entering the retreat and climbing the staircase to his room, Baba stopped for a moment and gently placed his hand on Watson's head. Baba's divine touch had such a deep effect on him that the old man wept like a child. From Baba's gentle touch, his heart burst and overflowed with love. Having observed similar incidents while on tour with Baba, Chanji took Mr. Watson into the library and made him sit down. Watson continued to weep for about fifteen minutes and then became quiet. His eyes filled with tears and he asked softly, "How long have you been with him?" "For seven years," replied Chanji. Hearing this, Watson placed his hand in a fatherly way on Chanji's back and said, "My son, do you realize how fortunate you are to have been living in such close contact with such a great personality?" "Yes sir, I do consider myself fortunate," Chanji answered. "It is his grace that I am near him." After a few moments of silence, Watson revealed, "In my seventy-eight years of life, today is the first time I have experienced what divine love is. 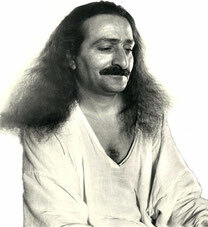 I have come to realize this with just a touch from Meher Baba." Chanji said, "Such a privilege is bestowed on very few." Without Watson's asking, Baba had rocked the grounds of his being. Watson's heart blossomed and he saw a new light – the light which dispels the darkness of ages. It was wonderful how the Master's work was manifesting. He was forging a link with Watson for a plan which, up to now, he had not revealed. Baba was planning on going to America from England and Watson was to be his medium for setting it up. 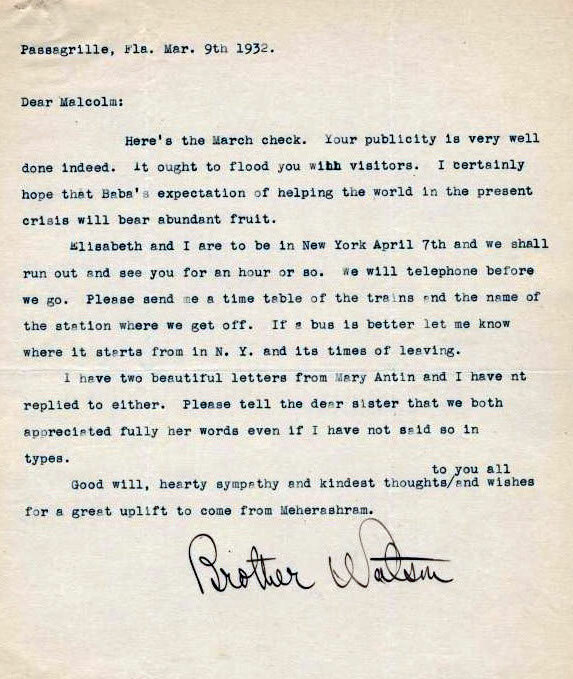 This is why Watson felt compelled to travel all the way to England just to meet Meher Baba. On one occasion, Baba explained to Thomas Watson about the different stages of the development of the mind and described how the mind experiences the universe. Baba indicated, "When our sight turns within, then the search for God begins. To attain Godhood, two things are required: first, pure conduct, and second, ideal service rendered selflessly." Watson asked, "What can I do? I am too old and feeble to render much service; but I can help in the other way you suggest." Baba gestured, "Don't worry. I will instruct you." That day, Thomas Watson said to Baba, "America is the country for a great spiritual worker like you. You must go there. If you permit me, I shall make all the necessary arrangements for you and your group to visit us in New York. On behalf of the American people, I extend my heartiest invitation to you to come to the United States." In May of 1931, Malcolm ( Schloss )saw Richard Mayer again in Boston. He also met Thomas Watson who, along with Mayer, was planning on sailing for England to spend some time at Meredith Starr's retreat. In June, Malcolm and Jean sold their bookshop and moved to Hancock, New Hampshire, to live communally with a group of like minded spiritual seekers from Boston. In July, Mary Antin called, saying Milo Shattuck had come back from England. Shattuck had not yet met Baba, but had heard all about him from Meredith Starr. Jean and Malcolm were deeply impressed. Norina Matchabelli was an old friend of Jean Adriel, and the day before Jean had left for Harmon to prepare for Baba's arrival, she had gone to see Norina at her apartment in New York. Norina candidly asked her, "Who is this Master at whose feet you would worship?" Jean tried to explain to her about Baba and about Thomas Watson's profound experience with him in England, but Norina remained unconvinced. On Sunday afternoon, November 22nd, Baba again met various people at the Vendome Hotel, including Thomas Watson and his wife, Mr. and Mrs. Max Gysi, and the astrologer-author Dane Rudhyar. Richard Mayer was also present and commented to Baba, "Only you know how you suffer." In reply, Baba spelled out, "I am infinite bliss, yet I feel compassion for all who suffer and help them through my knowledge and power. Thus, my mercy is my suffering." 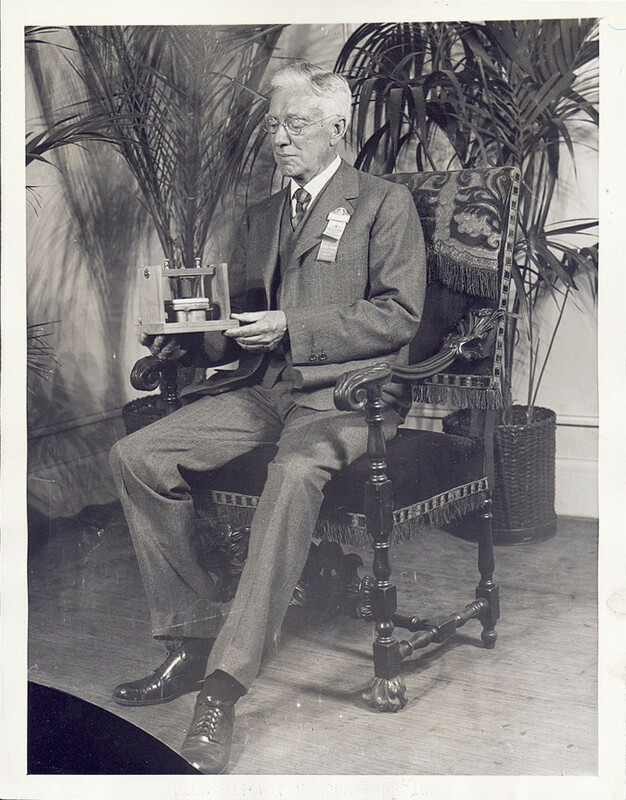 Thomas Augustus Watson (January 18, 1854 – December 13, 1934) was an assistant to Alexander Graham Bell, notably in the invention of the telephone in 1876. He is best known because his name was one of the first words spoken over the telephone. "Mr. Watson - Come here - I want to see you." were the first words Bell said using the new invention, according to Bell's laboratory notebook. There is some dispute about the actual words used, as Thomas Watson, in his own voice, remembered it as "Mr. Watson - Come here - I want you," in a film made for Bell Labs in 1931 which is referenced below in "The Engines of our Ingenuity." Born in Salem, Massachusetts, United States Watson was a bookkeeper and a carpenter before he found a job more to his liking in the Charles Williams machine shop in Boston. 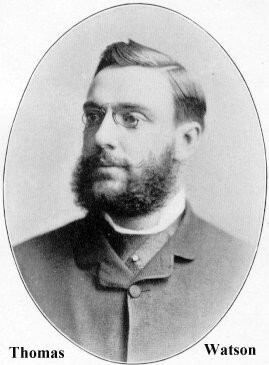 He was then hired by Alexander Graham Bell, who was then a professor at Boston University. 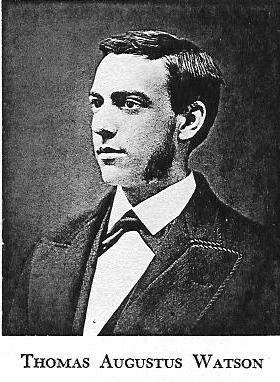 Watson resigned from the Bell Telephone Company in 1881 at the age of 27. Using money from his royalties from his participation in the invention of the telephone, Watson first tried his hand at farming and then set up his own machine shop. In 1883 Watson founded the Fore River Ship and Engine Building Company. He soon began taking bids for building naval destroyers and by 1901 the Fore River Ship and Engine Company was one of the largest shipyards in America. It would later become one of the major shipyards during World War II, after being purchased by Bethlehem Steel Corporation. 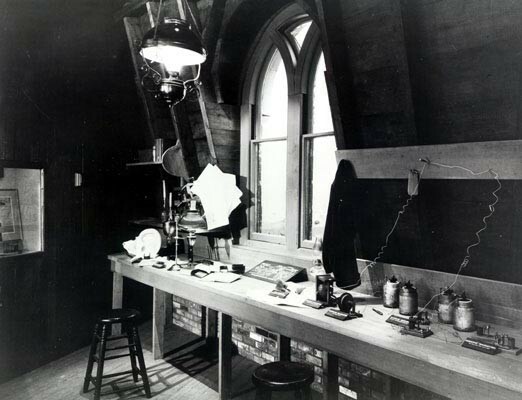 On January 25, 1915, Watson was at 333 Grant Avenue in San Francisco to receive the first transcontinental telephone call, placed by Bell from the Telephone Building at 15 Dey Street in New York City. 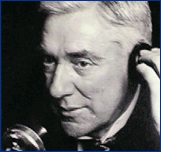 President Woodrow Wilson and the mayors of both cities were also involved in the call. Thomas Watson was married to Elizabeth Watson. After he died in 1934, she continued to live in Pass-a-Grille during World War II and died in a local hospital in St. Petersburg, Florida in 1949. Watson wrote an autobiography, Exploring Life: The Autobiography of Thomas A. Watson (New York: Appleton, 1926). 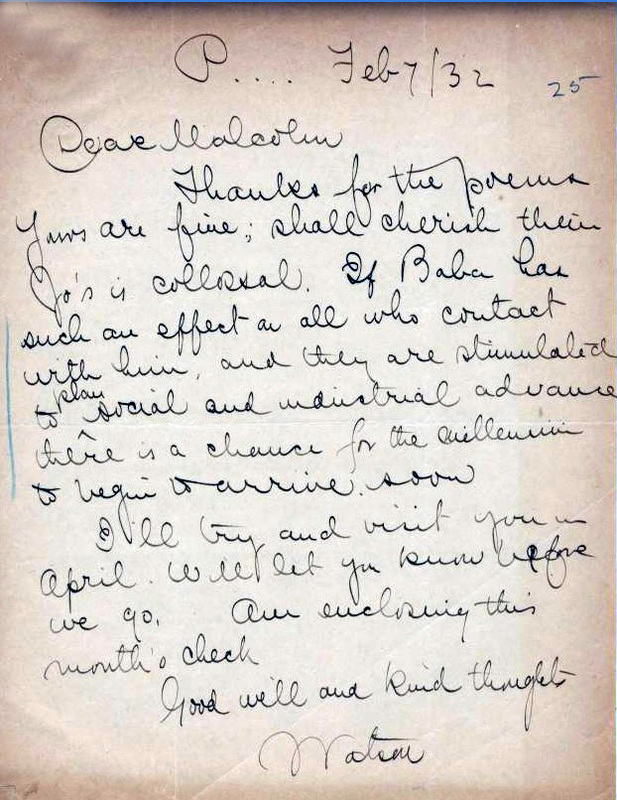 Late in his life, at the age of 77, upon being impressed with a meeting with Indian spiritual leader Meher Baba in England, Watson was instrumental in helping to arrange for Meher Baba to come to the United States for his first visit there in 1931. Later Watson became disenchanted with Baba. 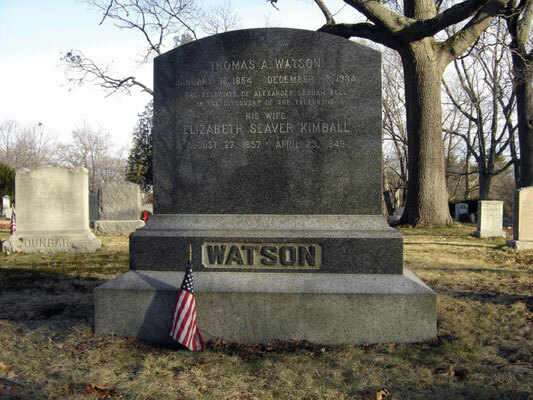 Watson died at his winter home in Pass-A-Grille, Florida, and is buried in the North Weymouth Cemetery, Weymouth, Massachusetts. His grave overlooks the Fore River Shipyard.